Chickpeas or Garbanzo Beans are a legume many of us are familiar with, in fact they are the most widely consumed legume in the world, but do you know the many nutritional benefits they have? Originating in the Middle East, chickpeas have a firm texture with a flavor somewhere between chestnuts and walnuts. Like most beans, they are rich in fiber; both soluble fiber, which helps to eliminate cholesterol from the body, and insoluble which acts like a “broom” in the intestinal tract (more on insoluble fiber later). They are a rich source of folate, vitamin E, potassium, iron, manganese, tryptophan, copper, zinc and calcium. As a high-potassium, low-sodium food they may help reduce blood pressure. Recent studies have demonstrated that the fiber in chickpeas can be metabolized by bacteria in the colon to produce short chain fatty acids (SCFAs). SCFAs provide fuel to the cells that line your intestinal wall, helping to lower your risk of colon problems, including possibly lowering your risk of colon cancer. 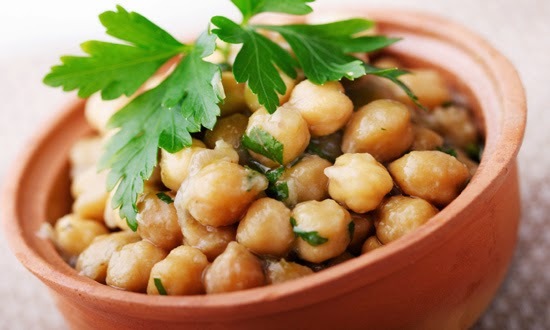 The soluble fiber in garbanzo beans also helps with blood fat regulation, including lower levels of LDL-cholesterol, total cholesterol, and triglycerides. Two cups provide nearly 25 grams of fiber! Introducing new fiber rich foods to your diet can cause gas and bloating, so start off slow! Curb your appetite: a recent study reported more satisfaction with foods when garbanzo beans were included; less calories and processed foods were also consumed. Researchers have recently found that many of the antioxidants present in garbanzo beans are especially concentrated in the outer seed coat that gives the beans their distinctive color. Darker-colored "desi-type" garbanzo beans appear to have greater concentrations of antioxidants than the cream-colored garbanzos, the "kabuli-type" that are regularly found at salad bars and in canned products. Antioxidants are found in both types as well as many minerals and other health promoting nutrients mentioned above. If you have previously stayed away from darker-colored or irregularly-shaped garbanzo beans, now’s the time to try them! Garbanzo beans can be purchased dried or canned and sometimes fresh. Always rinse canned beans before using and dried beans should be soaked for at least 4 hours before cooking. Read package specific labeling for further details. There are also chickpea snacks on the market, that will leave you feeling full and satisfied – check labels for allergens, etc.